We wish we could make every recipe absolutely fool-proof, but then we would lose the ‘art of cooking!’ However, in honor of #NationalKitchenKlutzesOfAmericaDay (yes, it’s a real thing, look it up) we made you an irresistible sausage bite that, yes, requires some attention and skill, but is totally worth all the effort. So, give it a whirl and let us know how you did! Melt butter in a small saucepan. Sweat the diced apple and shallot for 2-3 minutes over medium heat. Add mustard, honey, and rice wine vinegar and stir until combined over medium-low heat. Add water 1 tbsp at a time to achieve a glaze-like consistency. Bring to a boil and remove from heat. Add salt to taste. Preheat your grill to medium-high. When the temperature reaches 200, place the sausage on the grill and allow them to heat gradually. Cook on each side for approximately two minutes once the grill comes to temperature. 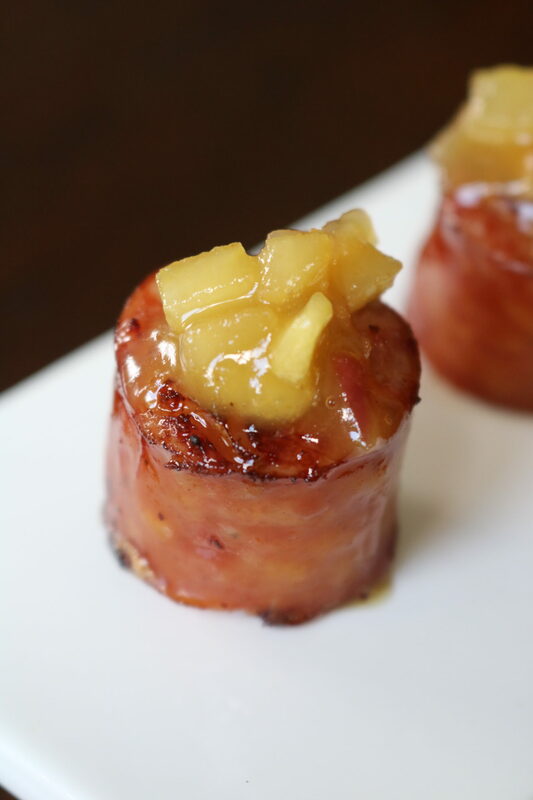 Slice sausage into bite-sized pieces, skewer with toothpicks and top with apple honey mustard chutney. Serve immediately. Enjoy!